The last stand with old computers was the most interesting from all of them. There were pretty old computers like Pong console, Commadore C64, Amiga 500, ZX Spectrum, old PCs, old Nintendo consoles and maybe other that I don’t remember now. They were running legendary games: Pong, Mario Carts, Duke Nukem 3D, Wolfenstein 3D, Quake, Doom and other similar top titles. 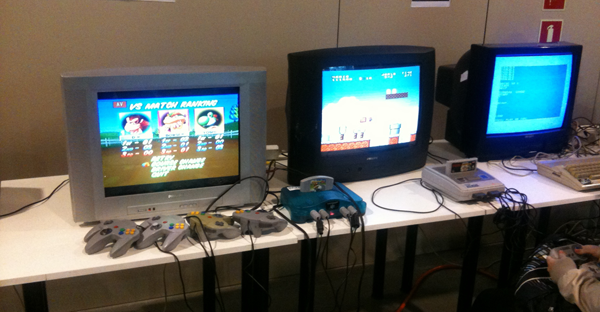 I was standing there for a long time, each day, with a big smile remembering lots of hours spend playing these games. I didn’t attend every lecture, because the number of them was impressive and some were in parallel. I was trying to see the most interesting for me. Sometimes I was simply tired and had to do the break. I will only write about most boring and most interesting lectures. I thought that presentation by Anna Godek from iPlacement will teach me something about iOS apps marketing, but after hearing that Angry Birds was Rovio’s 90th game (it was 52nd or so) and that InApp Purchase are used to buy new levels in games as the only example of freemium monetization model, I was dissapointed. Sorry iPlacement, I will not work with you in iOS apps marketing area. Paweł Rohleder from Techland was talking about small game developed by big company. He told many facts from big companies, but I already knew it after working at IBM and Sabre. Nothing new for me, but I want to say about the game they developed. It is Suger High, almost exact copy of Tiny Wings. I know that they wanted to earn some money and use proven gameplay, but come on Techland, you should do much better. Jakub Grudziński from Artifex Mundi had really good presentation last year about casual games. I really was looking forward to hear what he want to say this year, but.. It was almost the same presentation. Only small changes, the main idea and even screens taken from the last year’s presentation and only couple new screens from their new titles. Really nice guy and interesting lecture, but I had deja vu. Deferred Rendering is really interesting topic for graphics freaks like me, but Przemysław Witkowski from Drago Entertainment didn’t do well. Describing each deferred rendering technique with pros and cons, almost all without graphic examples (text only), together with sleepy voice of the speaker, it was disaster. Half of the listeners left presentation, the other (including me) was sleeping. Talking about graphic algorithms without pictures is not a good idea. Mobile Wings company should have two presentations, during two different days, but they didn’t reached GameDay. Mobile Wings, If you don’t know how to use Google Maps, just ask. They should be there or at least call earlier. Ok, enough of complaints. Now something that was worth participating GameDay conference. Farm 51 had two presentations lead by Artur Fiałkowski about realism in games and Wojciech Pazdur about their upcoming Adventurer game, which should be shipped early next year. These guys have huge knowledge about game design. It always really fun to listen to them. Michał Radziszewski from Drago Entertainment is unbelievable. Is there something he don’t know about 3D graphics? Again (according to last year) his presentation was very technical, but interesting. This time he was talking about OpenGL 3.3 and 4.2. Respect for his polish language. He uses polish translation for most of english technical words, what is really rare these days. The last, but not least, worth mentioning is Hubert Rutkowski from Reality Pump who was taking about modern game engines design and implementation. I remember him as a leader of Shader student group at AGH and lectures he was organizing back then. He knows a lot about game engines, but also about game development in general. It’s always good to listen experienced developers. Other presentations were average, so nothing interesting to write about them. Respect for Maciej Byczyński for creating such event. Keep up the great work! I’m already looking forward for the next GameDay edition. I hope that the discussion panel will came back, because it was one of the most interesting parts of previous conference.